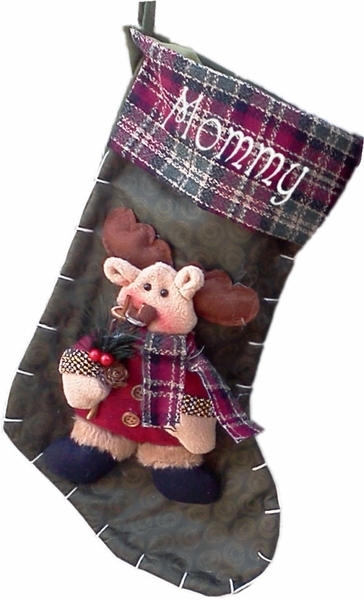 Our Merry Moose stocking has a handful of holly berry and leaves he must've collected on his way to your home. With a flannel patterned cuff. He also has The workmanship in these are flawless and make such a great stocking to hang over a war fireplace. He does have a matching set with a snowman or Santa so you can mix and match your collection! Measured The stocking is plenty big, about 19 1/2" diagonally and 8 1/2" wide. Materials: The stocking is made from green fleece and felt. With attention to detail in the cotton "3d" moose and a stitched border. Lining: YES. Stocking is lined on one side with satin and the other felt.